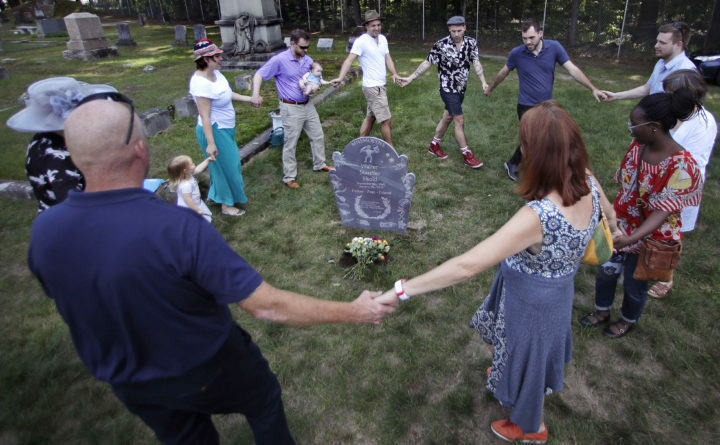 The family of Walter Skold, founder of the Dead Poets Society of America, dance and sing around his grave at the Pine Grove Cemetery in Brunswick on Monday. Skold died of a heart attack at the age of 57 in January 2018, little more than a month after enlisting the son of novelist John Updike to carve a unique grave marker. BRUNSWICK, Maine — The founder of the Dead Poets Society of America has been laid to rest under a special tombstone he commissioned before suffering a fatal heart attack. The family of Walter Skold read poetry, including some of his works, during the ceremony Monday at Pine Grove Cemetery in Brunswick. Skold combined humor, history and the macabre in his travels to the gravesites of more than 600 poets after launching the Dead Poets Society in 2008 in Maine. His ultimate goal, he said, was to draw attention to poetry and poets, especially those bards who were in danger of being forgotten. He died at 57 in January, a little more than a month after enlisting the son of novelist John Updike to carve a unique grave marker.